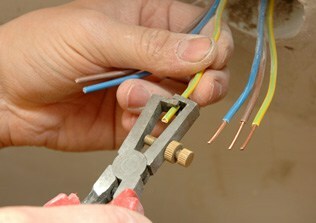 E J Lack Electrical have the skills and training to help keep your business on the top of its game. From safely completing small tasks, such as repairing lighting failures, to larger issues including rewiring works, you can trust us to improve your access to electricity. Committed to providing business owners with the care and attention their electrical systems require we offer ongoing maintenance and care, personalised to your office or store’s setup. Specialising in general maintenance, installations, alterations, and complete workplace or shop fitouts you can trust the team at E J Lack Electrical to keep the power on in your commercial environment. From installation and maintenance our certified electricians can keep your site well-lit. We can also upgrade your space to LED lighting arrays. Our electricians will install effective photoelectric smoke detectors that are powered directly by the mains and have battery back-ups to prevent smoke from being undetected. Strategically placed around your property, phone points allow for installation of phones. Be connected to the internet with our ultra-fast data cabling. Allowing for the transmission of vast amounts of data our data cabling ensures your business operates at optimal efficiency. See who’s outside your office without leaving your desk. Our intercom systems can be installed throughout your office for convenience. Immediately cut off the supply of electricity in case of emergency with our accredited and responsive safety switches. 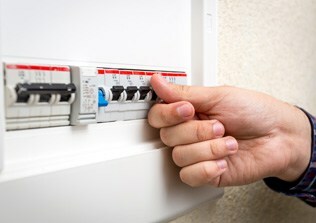 Completing the installation of new mains, or replacing existing mains, we can ensure that you stay connected to the power supply. 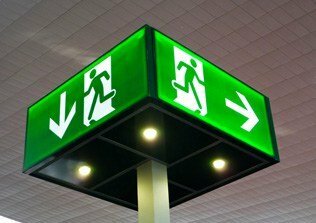 Guide your employees in the right direction with our regulation exit and emergency lighting solutions. Strategically-placed and flawlessly-installed out exit and emergency lighting can help keep your workplace safe in the event of an emergency. 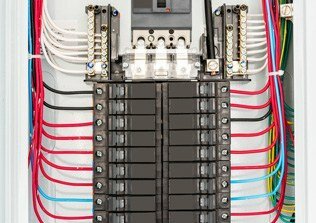 Installing modern switchboards, complete with safety switches, for increased safety and reliability. Conducting detailed inspections, our skilled and professional team can identify the cause of the fault and repair it efficiently. 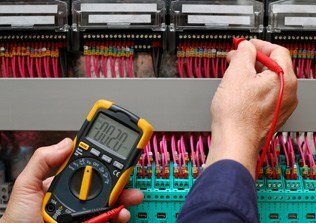 Our experienced and fully-qualified team can methodically test and inspect your wiring to ensure it is up to code. Keep your appliances compliant thanks to our reliable testing and tagging solutions. Adhering to industry regulations and requirements we can ensure that your equipment meets operational safety standards. 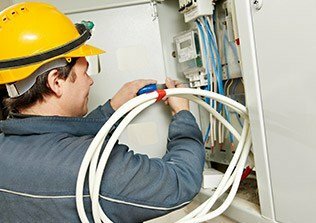 Ensure that you and your employees are safe by trusting us to keep your electrical systems and equipment working without fault. As dedicated and skilled electricians, our team can conduct extensive and reliable improvements and alterations to ensure that your site is up-to-code and compliant for insurance requirements. Able to highlight hot spots in your systems and electrical appliances, thermographic imaging allows our team to identify potential future faults. Ensure that your appliances and systems are not only safe, but OH&S-compliant thanks to E J Lack. Working in conjunction with safety switches, our earthing systems improve the safety of your electrical systems.